Did a pipe burst? Did the roof leak during a storm? Now that the flow of water has been fixed, you are left with a wet mess in your home. Now you need help to remove that moisture deep within walls, floors, and contents in order to avoid a wide range of problems in the future. The science of “psychrometrics” is the measurement of the heat and water vapor properties of air. Professional restoration is not simply wiping up water and placing a few fans; it is the art of thoroughly drying building materials and cavities to prevent the deterioration of structural components and the formation of microbial growth. The commercial offerings for water damage services include water extraction, structural drying, dehumidification, thermal energy drying, mold prevention, carpet cleaning, structural repairs, and other services; how do you know which are needed? Everything will dry more quickly and clean more easily when the team works to reduce the humidity and prevent mold. Fans help to move the air and dry out your home. Do not use central air conditioning if the ducts were under water; they will blow out dirty air that might contain contaminants. Let an expert like Yellow Van properly place multiple fans to maximize drying. Professional dehumidifiers reduce up to 50% more of the moisture, compared to units designed for the home. Heavy duty and rugged, these dehumidifiers quickly and efficiently extract water, dry flooring, and curb harmful mold growth. Water damage dehumidifiers typically feature large wheels for mobility and internal pumps for no-hassle water removal. Desiccants are materials that absorb moisture and can be used in drying closets or other closed areas with poor ventilation. The simplest example is cat litter made of clay. Calcium chloride pellets, used to melt ice in the winter, are another option. Ask the experts, the professional products do not make the air salty and are safe near computers and electronics. A hygrometer, psychrometer, is an instrument used to measure relative humidity. A low tech version can be found in your yard; pine cones open when dry and release seeds or close up tight when wet. A much more accurate version is a commercial thermo-hygrometer, which tests for humidity, dew point, grains per pound, and ambient temperature to provide an accurate measurement of the moisture in the air. Moisture meters help professionals diagnose and document residual moisture. Non-invasive meters simply press the handheld instrument onto the surface being tested leaves no trace and no damage to the materials being tested. Invasive moisture detection uses pins and probes for testing the building materials, primarily lumber. Both tools might be used in throughout your project. 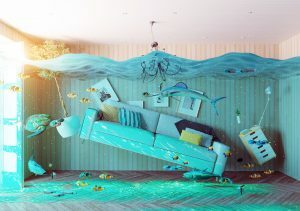 Managing water damage on your own can be overwhelming. The factors that go into determining how to clean up damage are complex. Since 1981, Yellow Van Carpet and Restoration technicians have provided environmental services that get people back into clean, healthy homes. Reach out to Yellow Van Cleaning & Restoration in Holdrege for water damage restoration services. For immediate assistance, get emergency services 24 hours a day, 7 days a week by calling 1-844-755-7416 or visit yellowvan.com.